Thank you for the props. I really like Morgans. When they had to make new master dies for the '21, I think they missed the original by a little. I figured if I was going to add a '21, I'd try to find one in PL. Happy with the coin. I think the mirrors on the OP's coin might be a little better than mine. Break from collecting. Hello again. Welcome back BLive1972. It looks like you and I joined here about the same time. I haven't participated on these boards in the last few years. I've been on another site (not ATS though). I've learned a lot since I joined this hobby in 2012 and still have a lot to learn. I viewed your circulated Merc thread. You have some real beauties there. I look forward to seeing more of your collection. Here's my '21 65 PL (NGC). I've had it for a few years now. I've since added some medals as well. The white mark on the reverse of the Warwick medal is actually on the holder. I'm a victoria fan as well. It started when I won this coin. 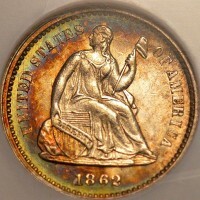 Very pretty '80 S. I agree with much of the sentiment that PCGS was a little harsh on that coin. I couldn't really detect PL from the photos, but I thought 64/65 based on your earliest photos. I have a couple Morgan/Peace dollars in 62 (different dates and mm: '02 S Morgan and '28 S Peace) that I think were also harshly judged. They have very nice luster, strong strikes and very few distracting marks. My plans are to hold on to them as is and enjoy them. This is a busy time of year with all the ASE's and new mint products being released. The '40 S and '43 are my favorites of the ones you posted. Great set of coins! Winged Liberty is one of my favorite designs. I just with the coins were larger. Would have been ideal as a quarter. Just my humble opinion. Based on the comparison pictures posted, I think it's a 1795. 1890 CC Morgan Dollars Grade? To the OP: Just a piece of advice. Before you buy raw coins, you should learn how to grade them. It will save you some financial heartache in the long run. I made some some raw coin purchases before I learned to grade the series and was disappointed with the results. Thankfully, they weren't huge financial mistakes, but I learned quickly. Had something similar happen to a christmas present I bought for a relative. I was tracking it because I waited too long to buy it and I knew it would be a close call in arriving on time. I started to relax when it arrived in Denver. Next thing I knew it went to NY, then to NJ, then to OH. Let's just say it was late...lol. I hope the wait will be worth it for you. Congrats on your first submission. It's quite a fun process and the anticipation in seeing the grade posted is fun. It's also possible that Dansco improperly printed the album. Thank you. It's actually much nicer in hand. I'm having a difficult time find "S" mint Peace Dollars to complete my set, but I hope to finish within the next year or two. Sorry you lost the coin Jason. I know how you feel. I did not have any luck at HA today. 3 coins I bid on, didn't win one. I was thinking the same thing, what a waste of peace dollars. His concoctions are not even mildly attractive to me.